Mixed Martial Arts is a fascinating sport and we are all attracted by the excitement, endurance and exceptional performances witnessed within the cage. JUST MMA is here to provide a professional and unprejudiced competition platform for those who like to compete, as well as those who enjoy the fierce competition. Our management team made up of Tony, Lok, Ashleigh and Andrew will continue to bring you the best MMA events as we have done in the past few years. We would like to thank the local community for your support and our transition would not have been so smooth without you. Join us for our inaugural event “JUST Challenge – Hong Kong”. Just you, Just us – JUST MMA. Andrew has more than 25 years of finance and real estate experience in Asia Pacific. He is currently the Chairman and CEO of a Singapore listed company engaging in IT businesses. Tony has more than 25 years of structured finance and media management experience in Asia Pacific. He owns and operates multiple entertainment & media companies in Asia. 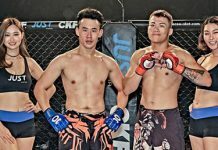 As the sport of Mixed Martial Arts (MMA) rapidly expands across the globe, Asian MMA responds accordingly. As MMA grows, it becomes increasingly harder for talented practitioners to get opportunities, exposure and impartial support throughout their development. JUST MMA is a platform for fans and practitioners alike to have access to exhilarating events featuring upcoming and internationally acclaimed fighters. JUST MMA is dedicated to growing the culture behind Mixed Martial Arts and create an environment where Martial Artists and fans alike can thrive. Amateur feeder programmes, semi-pro undercard, Sponsor’s Mini Fight Series and Major Events are in place to create a safe, structured yet competitive system that give fighters and fans what they want. JUST MMA hopes to educate casual spectators of the prevailing fundamental value behind Mixed Martial Arts: Respect. 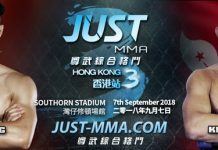 JUST MMA is founded in Hong Kong, nurtured in Macau and soon expand into China. Broadcast live and OnDemand on NowTV Sports and streamed live internationally via online broadcasters. JUST MMA is the hub for global grass-root warriors, driven by passion, an advocate of respect, committed to greatness and won’t let anybody stand in their way of their pursuit.